"Even the solutions that we have considered big and bold are nowhere near the scale of the actual problem that climate change presents to us," Ocasio-Cortez told NPR's Steve Inskeep in an interview that aired Thursday on Morning Edition. On top of all that, implementing all of these policies could cost trillions upon trillions of dollars. Altogether, the Green New Deal is a loose framework. It does not lay out guidance on how to implement these policies. And again, all of this is hypothetical — it would be tough to implement and potentially extremely expensive ... if it passed. The phrase was also used around President Barack Obama's 2009 stimulus, which had around $90 billion worth of environmental initiatives. This latest iteration is different both in the political energy that it has amassed and the grand scope it is taking. While it was a product of the progressive activist community, Ocasio-Cortez has been perhaps the most visible proponent of the plan and has helped it gain nationwide attention. After the deal's Thursday release, she also cast the plan as simply one of any number of environmental proposals the House might consider. "It will be one of several or maybe many suggestions that we receive," Pelosi told Politico. "The green dream or whatever they call it, nobody knows what it is, but they're for it right?" "I think it's like a really weird instinct that the Democratic Party develops to not be exciting intentionally," said Sean McElwee, co-founder of the progressive think tank Data for Progress. "Most of politics is getting people excited enough to show up and vote for you. And I think that a Green New Deal and Medicare-for-all — these are ideas that are big enough to get people excited and show up to vote for you." But it's not just about national politics. The national-level energy for a Green New Deal could boost efforts in cities and states. New York Gov. Andrew Cuomo, for example, has been pushing a Green New Deal in his state. Aside from the politics, there's the fact that climate change remains an impending threat — one for which the world has yet to come up with a fix. "It's a big legislation because it's a huge [expletive] problem! We're all going to die," said McElwee. "Every week it seems like the risks of climate change become more real, and the amount of devastation it is going to wreak upon humanity becomes larger, and that means we have to do bigger things." 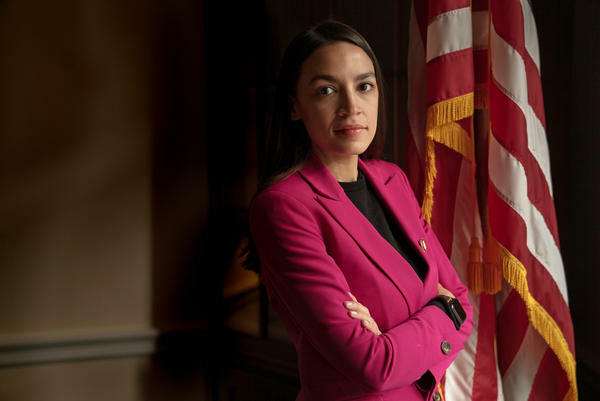 Two progressive Democrats have unveiled what they're calling the Green New Deal, New York Congresswoman Alexandra Ocasio Cortez and Massachusetts Senator Ed Markey are advocating for an overhaul of the nation's energy sources and economy. In a minute, we're going to hear what former Energy Secretary Ernest Moniz thinks of this plan. But first, a closer look at the details - while the chances for this plan in Congress are slight, the Green New Deal could reshape the climate change debate. Here's NPR's Danielle Kurtzleben. DANIELLE KURTZLEBEN, BYLINE: The first thing to know about the Green New Deal, it's ambitious - really, really ambitious. Ocasio-Cortez told NPR that's because it needs to be. ALEXANDRIA OCASIO-CORTEZ: Even the solutions that we have considered big and bold are nowhere near the scale of the actual problem that climate change presents to us, to our country and to the world. And so while carbon taxes are nice - while things like cap and trade are nice, it's not what's going to save the planet. KURTZLEBEN: The new legislation calls for a variety of measures to drastically cut carbon emissions. In the process, the goal is to not just massively create jobs but transform the economy. Ocasio-Cortez says the aim is to get to net-zero carbon emissions in 10 years. To do that, the legislation lays out some lofty goals - for example, upgrade all buildings in the U.S. for greater energy efficiency - not only that but it includes a wish list of progressive economic policies - for example, guaranteed jobs, all of them with family and medical leave and paid vacation. Importantly, it's a non-binding resolution. It wouldn't create any programs. Rather, it's a plan for future bills that will fall under the Green New Deal heading. OCASIO-CORTEZ: Any legislation that wants to call itself part of a Green New Deal, a Green New Deal project or Green New Deal legislation has to meet this scope. KURTZLEBEN: Now with the resolution out there, the critiques of the plan have begun. For example, the goal of net-zero emissions in 10 years may not be reachable. Here's Jesse Jenkins, a postdoctoral fellow at Harvard's Kennedy School. JESSE JENKINS: Where we need to be targeting, really, is a net-zero carbon economy by about 2050, which itself is an enormous challenge. 2030 might be a little bit early. KURTZLEBEN: There is virtually zero chance it will pass this Congress. House Democratic leadership seems lukewarm on the plan. Speaker Nancy Pelosi said this today. NANCY PELOSI: Quite frankly, I haven't seen it, but I do know that it's enthusiastic. And we welcome all the enthusiasms that are out there. KURTZLEBEN: In addition, the potential for massive spending is a non-starter with Republicans who control the Senate. Francis Rooney, Republican congressman from Florida and co-chair of the bipartisan Climate Solutions Caucus, believes the bill could be a good place to start a conversation on climate change - even if he doesn't like many of the particulars. FRANCIS ROONEY: I think a lot more analysis would need to be used to figure out how to go from these concepts to something that can practically be accomplished and not destroy the economy and the job growth and all that. KURTZLEBEN: Beyond Congress, the Green New Deal is already part of the debate in the 2020 presidential campaign. Here's an Iowa voter pressing Democratic candidate Kamala Harris at a CNN town hall. CAMERON VAN KOOTEN LAUGHEAD: Will you fully endorse the Green New Deal tonight? KAMALA HARRIS: I support a Green New Deal, and I will tell you why. Climate change is an existential threat. KURTZLEBEN: In addition, some proponents are hopeful that Green New Deal-style policies could take root at the state and local level. New York Governor Andrew Cuomo, for example, recently put out his own version. For Markey and Ocasio-Cortez, the bill does one other important thing - help them dictate the terms of the climate change conversation. OCASIO-CORTEZ: We started seeing a lot of other folks saying - oh, well I have a Green New Deal and call lots of things a Green New Deal. And so the first step that we need to do is define what Green New Deal legislation is. KURTZLEBEN: As Ocasio-Cortez's office said in a document provided to NPR, they'll be working on legislation soon, which is, quote, "important to say so someone else can't claim this mantle." Danielle Kurtzleben, NPR News. Transcript provided by NPR, Copyright NPR.